Out of Print Book Club is billed as a mix between First Tuesday Book Club and Whose Line is it Anyway? 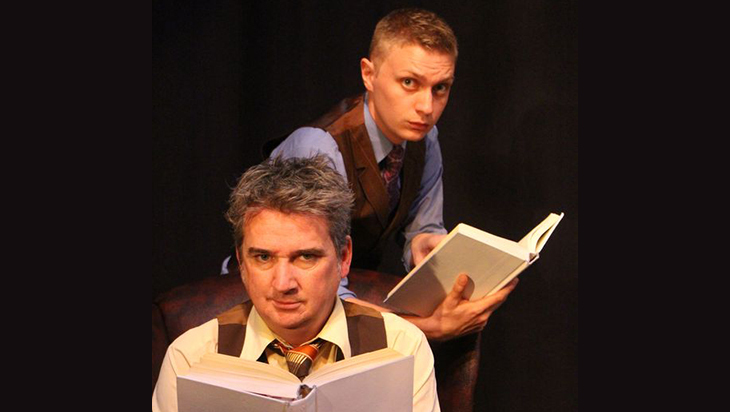 What a fantastic premise for a comedy festival show – an improvisational hour of comedy about non-existent books. Comedian Damian Callinan and actor Tim Overton, host the evening in the beautiful Council Chambers at Melbourne Town Hall. There is a rotating list of guest artists and on the evening we attended they were writer Emilie Collyer, comedian Gordon Southern and veteran of the improv scene Lliam Amor. Our hosts direct proceedings leading their guests in a series of book discussions and dissections. With different artists each evening the performance will vary depending on the chemistry on stage and the material they have to work with. Some of the set-ups were a bit too obtuse for the cast to play with but Collyer in particular was an utter delight. The whole experience became more fun when audience members were encouraged to participate. My favourite line for the evening came from an audience member who responded to the question of unpublished Little Miss titles with the suggestion of Little Miss Ogyny. Overton plays the show’s theme on keyboard and moves proceedings along nicely but there’s something of a missed opportunity about the whole show. Surely with the theme, the setting and Callinan’s gift for character comedy there is room to play up the concept of discoveries of rare and antiquated books. And Overton’s acting and musical chops could be better utilised – a Whose Line is it Anyway style hoedown given a bookish twist would be great. This is a good show with the potential to be a best seller. Perhaps a quick edit of the Out of Print Book Club will lift it to a position on the top shelf.